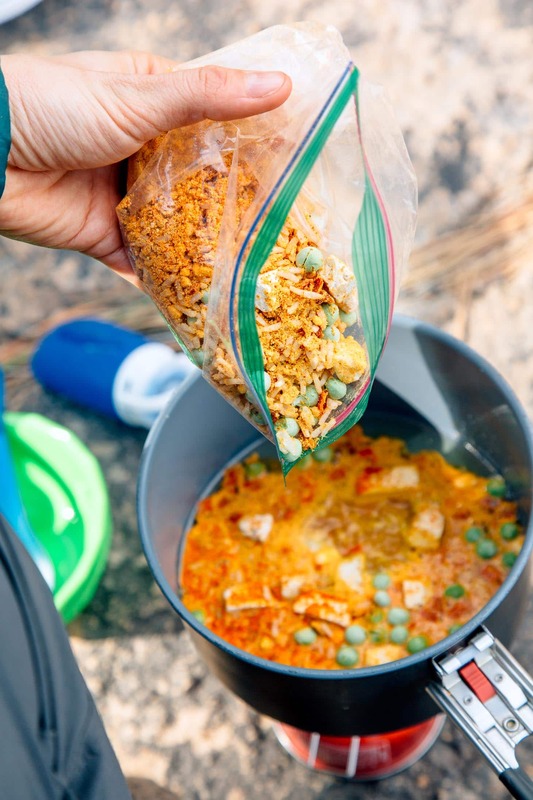 Rich, creamy, and super filling – this simple red curry is a great backpacking meal for your next trip into the backcountry. This recipe is sponsored by humangear. check out the bottom of this post for details! When hiking at elevation, especially early or late in the season, the temperature can drop without warning. There have been times where we hike the whole day in shorts and short sleeves but are forced to throw on every layer we have the minute the sun goes down. But on cool nights, one way of the surest ways to lift our spirits is a warm bowl of spicy curry. At home, curry is one of our all-time favorite cold weather comfort foods. It’s quick, easy, and can be modified to use whatever ingredients we have on hand. 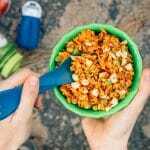 Now, making a great bowl of curry while backpacking does require a little more foresight than our free-wheeling weeknight dinner approach, but it still has all the same benefits. It’s fast and simple to cook out in the field and can be altered to accommodate an array of different special diets. For the base grain, we’re big fans of Minute Rice instant rice. Both the white rice and brown rice versions cook incredibly fast (around 5 minutes), which saves fuel and therefore weight in our pack. At home, we use curry paste, but out in the field, we use curry powder. For this particular recipe, we used Thai Spice from Spicely, but we have also experimented with McCormick’s Red Curry Powder and the Thai Style Red Curry Powder sold under Kroger’s Private Selection brand. Whatever spice blend you end up using, make sure you try it out before your trip to ensure that your meal has a spice level you’re comfortable with. To make the curry sauce, we mix the curry powder together with some powdered coconut milk and a little bit of PB2 powdered peanut butter. It’s only three ingredients, but it produces a really complex sauce that’s creamy, spicy, and slightly nutty all at once. After a long day on the trail, we think it’s important to incorporate some protein into our dinners to help our muscle repair overnight. For this recipe, we used dehydrated chicken, which we had purchased in bulk. However, TVP (textured vegetable protein) or soy curls would be excellent vegan options as well. For this recipe we had the opportunity to partner with humangear. 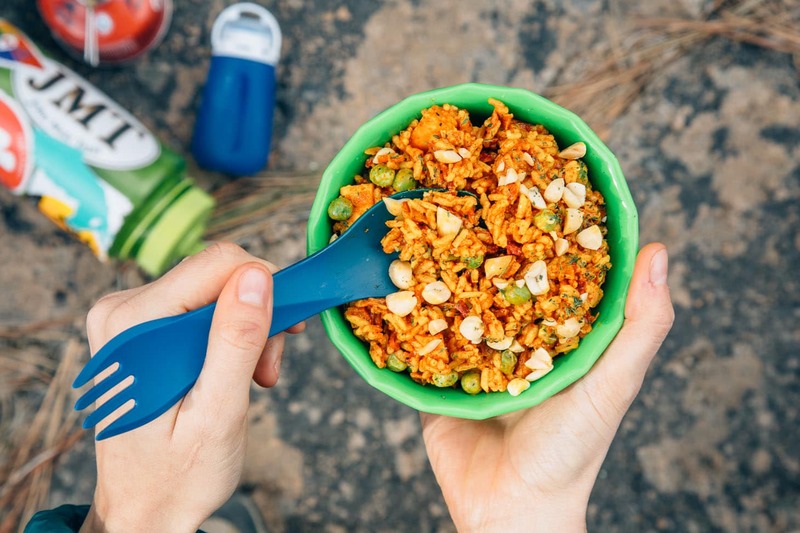 We’ve been using their smartly designed camping utensils for the past few years, but we recently got the chance to test out their new Flexibowl and GoToob+ liquid containers. 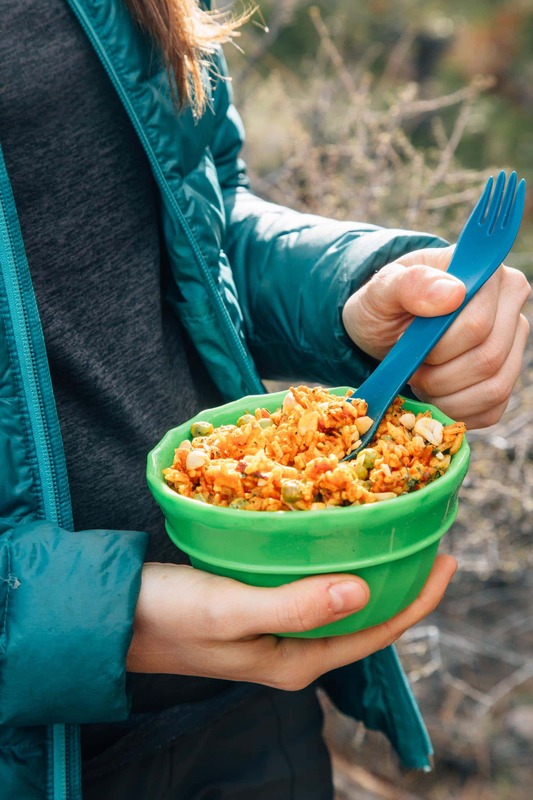 We really like that the FlexiBowl can fold in half for different meal sizes, turned inside out for easy cleaning, and squeezed to fit into any space inside our bear canister. As for the GoToob+, they are the only liquid container we’ve tried that we have 100% confidence in. Trust us, all you need is one catastrophic cooking oil leak inside your pack or bear barrel to understand the importance of having a quality liquid container. We also really appreciate the extra peace of mind that the LoopLock cap provides. We’re using GoToobs now and we’re never going back! So if you want to chase away the chills on your next backpacking trip, give this Thai Red Curry a try! 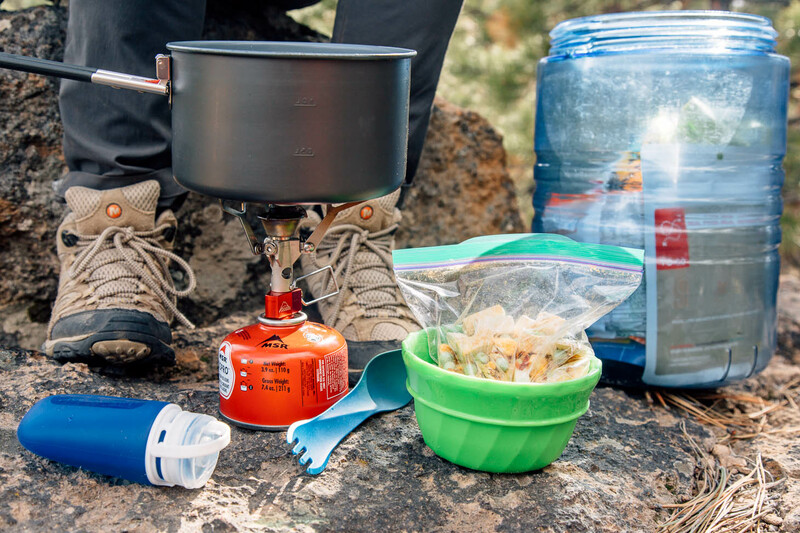 And if you’re updating your backpacking kitchen set up, we’d suggest checking out humangear. humangear is offering our readers an exclusive 15% discount on any of their products. Head over to their site and use “freshoffthegrid15” at checkout to take advantage of this offer! 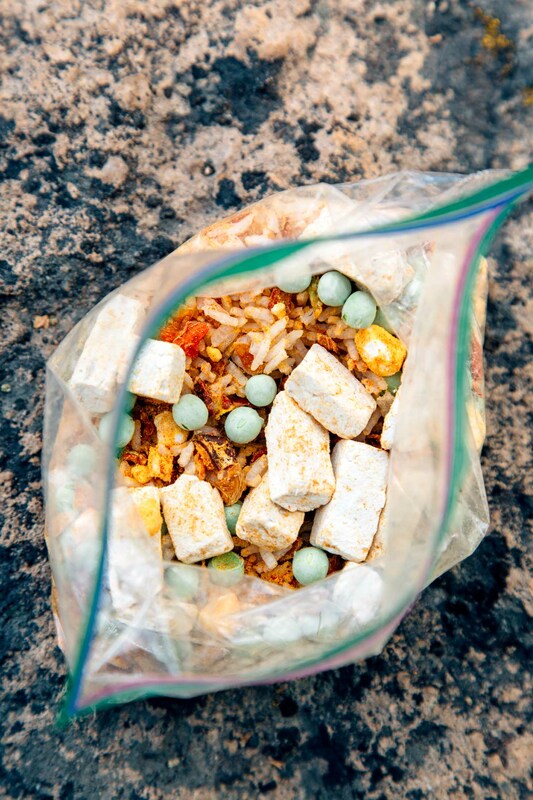 Rich, creamy, and super filling - this simple red curry is a great backpacking meal for your next trip into the backcountry. 2 tablespoons Thai red curry powder, more or less depending on spice preference! At home: Add all the dry ingredients to a ziplock bag. Pack the oil in a GoToob+ bottle. 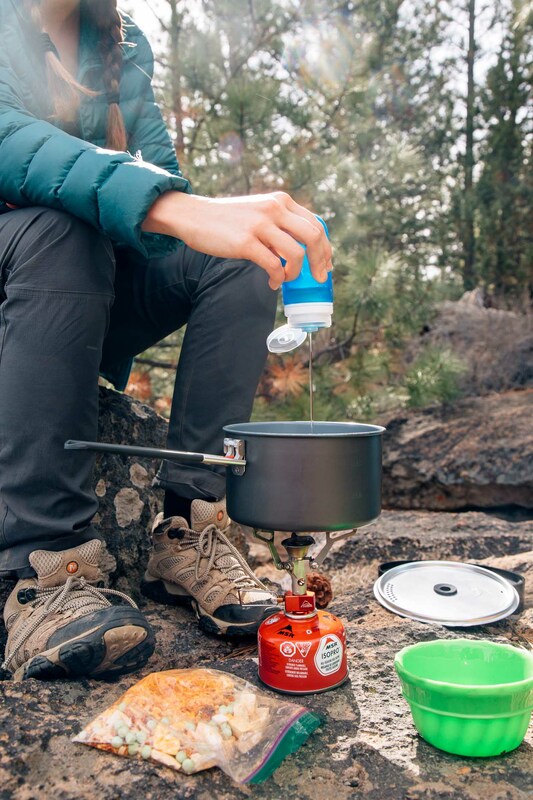 At camp: Bring ¾ cup (6 oz) of water to a boil. Add the contents of the ziplock and the oil to the pot and stir. Cover and simmer 5 minutes or until the rice, chicken, and veggies are rehydrated. I cooked up a test batch at home, with a *few* (ahem) modifications, in advance of an upcoming hiking trip. Really good!… I used a packet of instant ramen noodles (without seasoning) instead of rice (two cups of water to cook, per the ramen cooking instructions) which made it a little soupy, but still good; added the chicken and veggies while the oil was coming to a boil to give them more time to rehydrate. Added an extra TBSP each of the peanut and coconut milk powder, plus about a teaspoon of dark brown sugar). Didn’t add any oil and it was fine! (In lieu of vegetable oil, trader Joe’s sells individual packets of coconut oil, which might be an easier carry, and add a bit more flavor, if you want to add some fat to replace all those hiking calories you burned :)). PS:If you can’t find the Thai curry powder,I bet a small amount of regular Thai red curry paste would keep and carry just fine for a few days on the trail, wrapped in some foil. Where do you buy powdered coconut milk? Amazing! It can be purchased on Amazon https://amzn.to/2J51KXr or at a local Asian market. Otherwise, you might be able to find it in the Asian section of some grocery stores. We usually keep an eye out for it and it’s really inconsistent which grocery stores carry it. Hi! I was wondering if you’ve tried making this in bulk and then using a dehydrator to dehydrate it? We haven’t tried making this as a dehydrator meal yet. Since it uses all dried ingredients (well, plus the oil added on trail), it’s easy enough for us to just measure out the ingredients into baggies and go. I’m sure it could work as a dehydrator meal, though! One consideration is that since fats don’t dehydrate well, you’d want to use the PB2 peanut butter powder (instead of “real” peanut butter) and maybe add in the powdered coconut milk after dehydrating? If you try it, I’d be interested in hearing how it goes!